MONTGOMERY, Alabama – A report on Alabama’s unemployment rate in October points to continuing improvement in the state’s economy. October’s preliminary rate was 6.3 percent, down from September’s rate of 6.6 percent and even with the rate a year ago. The number of employed Alabamians reached 1,948,000, the highest figure since December 2008, before the Great Recession began to weigh on wage and salary employment in the state. October’s employment number increased by 9,800 from September and 33,100 from October 2013. In percentage terms, the 1.73 percent year-over-year gain was the steepest since June 2006. Alabama’s manufacturing sector gained 7,500 jobs over the course of the year, while its construction industry added 3,200 jobs. Big gains were also registered in professional and business services, and leisure and hospitality. 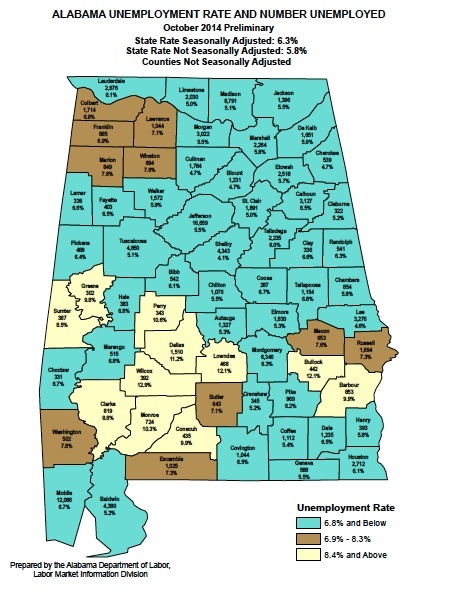 October’s rate translates to 133,470 unemployed Alabamians, down from 140,555 in September. “The October unemployment rate is good news for Alabama,” Governor Robert Bentley said Friday. “We are seeing healthy growth in the number of jobs our economy is supporting, and that is a testament to our efforts to recruit quality companies that bring good jobs to Alabama. In addition, October brought several economic development announcements that mean more jobs down the road. These included Knauf Insulation’s plans to double output and add 100 workers at its Chambers County plant and Steris Corp.’s plans to relocate the headquarters of its global specialty services business to Birmingham, a move creating 100 jobs.